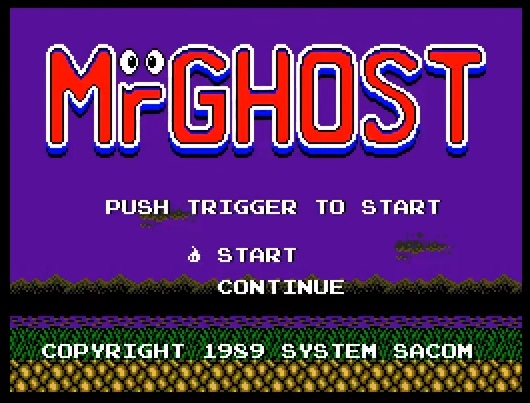 What a lovely wake up call as we've recently found out thanks to a heads up via Facebook, that the MSX2 game of MrGhost by System Sacom which was released way back in 1989, has been fully translated into English by 232 & Max Iwamoto and is available to download as version 1.0. According to a post in 2004 via the MSX website this game was voted the most underrated MSX game of all time, with 180 votes counted. In this lovely looking game for the MSX2 you play as Mr. Ghost has been suddenly turned into a ghost and lost all of his memory of his previous life. The only thing you do know is there are spirits referred to as little droplets who are imprisoned and you probably have to help. So begins your journey as you bash blocks, float through screens, destroy enemies all the while listening to the very upbeat music.